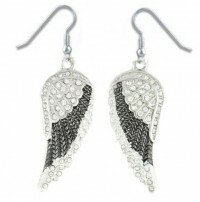 Large Angel Wing Earrings with clean clear imitation Crystals for that added Bling look, along with the black to help set it all off. Hanging on a French wire for that free feeling. Made from clean 316L Stainless Steel. Don't forget the matching Necklace (SSP 36) or (SSP 42) for that complete set.